Family history enthusiasts, take the opportunity to sign-up now for MobileTree, an app which provides access to the content available from the genealogy-rich website: new.familysearch.org. 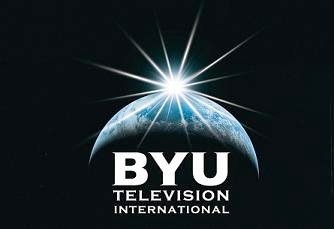 (please be-aware that FamilySearch login credentials are required from the LDS or Mormon Church to use the app. Connect to the website: http://new.familysearch.org for accessibility requirements). Available at a limited-time introductory price of $4.99, MobileTree will provide remote access to family history dates and names gathered through literally hundreds of thousands of hours of research. MobileTree has completed all of the requirements communicated by the FamilySearch organization and has been CERTIFIED as an approved access application. - An individual ancestor. What events are recorded for this individual including birth, death and burial? - A family record. Can you identify an ancestor’s siblings? Who is the youngest child; who lived the longest? Where are they buried? - Your pedigree record. 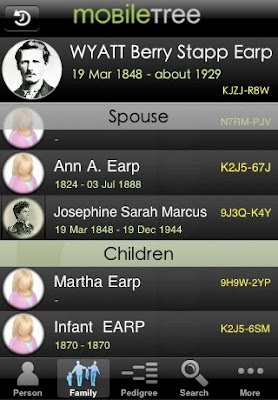 Use MobileTree to see an ancestor’s parents, and grandparents using existing and available content. - Add a photograph of your Great,Great Uncle. - Upload a picture of your grandmother’s birthplace. Take a photo of her favorite flower. - Add a story that you would like to retain and eventually share with other relatives. 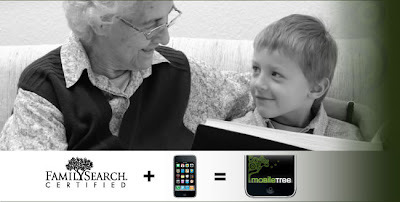 Simply-put, MobileTree delivers mobile-friendly access to content provided through new.familysearch.org. Please make sure that you can acquire the appropriate credentials before downloading this app.